People will continue to need physical tools to capture spontaneous ideas, even in the future office. This was addressed at Paperworld in Frankfurt, the international trade fair for paper & printing trends (26-29 January). Cool design, customization and eco-friendly production appeared to be the overarching themes. Only few exhibitors envisioned new functionalities for paper. Bridging the gap between the physical and the digital world is one of the challenges for the future, said Anika Bötherin from Legamaster. But the need for such innovative solutions really depends on how we work together. For example, this question is most relevant to teams working from different locations. They benefit from smart tools aimed at jointly working on the output of, let’s say, sticky notes. 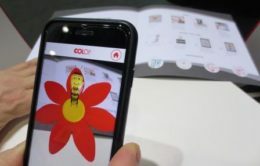 The Augmented Reality motivation stamp from Austrian company COLOP belongs to the category ‘nice to have’. Their stamp imprint becomes a fun 3D experience to reward children for good work at school. What matters is the joy of positive feedback, said marketing manager Gerald Binder. After a successful launch last year, today’s obstacle is the awareness that the imprint comes with AR. How to motivate parents to take action and download the app? In the end, putting a smile on the faces of children may not be enough for the stamp to become commercially viable. But it demonstrates that building on existing technologies may result in new learning experiences with traditional paper. An outsider on the fair, but one that sparked the imagination, was Stone Paper Benelux. The Dutch company presented paper made from rocks. Distinctive because of its characteristics, it’s waterproof and made of waste materials, stone paper triggers us to rethink circularity. That sounds like a need!